We have been in full-on summer mode around here. Lazy mornings, late nights, bonfires with friends, and reading…lots of reading. We just returned from a week in a small town in Wisconsin. We spent some time in the Dells and then some quiet time on Lake Wisconsin. But, the best part was it was just the 5 of us spending time together. I got some blissful reading time in but didn’t read all four of the books I brought along with me. My eyes are always bigger than my brain time. By far one of the best books I have read this year. I highly recommend listening to the audio version, but reading it would be just as good I have no doubt. I can’t stop thinking about Westover and her life. From poverty, to no education (beyond Bible teachings), to the abuse by her brother, to her going to college just amazed me. She just proves that you are not defined by your family or your circumstances. I still want to google her for more follow-up information since her book was written. She is such an inspiration. Her story made me cringe, weep, drop my jaw, and laugh sometimes all on the same page. This book reminded me of other nonfiction and fiction books I loved like THE SOUND OF GRAVEL, THE GLASS CASTLE, and THE GREAT ALONE. This book kept appearing in my radar and so I finally read the synopsis and immediately added it to my library overdrive list. My turn came up when things were crazy in May but I got about 2/3 of it read before it expired. So, I put myself back on the list and finished it last week. A family comes together over Christmas and is forced to stay together due to a quarantine. Every single person in the family has a secret and when they all come out, everyone’s true sides come out of hiding. The family is part of a sort of English aristocracy so they live in a huge home in England. It’s easy for the parents and two adult daughters to hide out from each other. Each chapter starts with a specific character, their location in the house, the day of quarantine, and time of day. The story is told from their respective views. It’s like a bad accident, you can’t turn away, and have to know what happened. You won’t believe all the secrets each of the characters is hiding and how their secret will affect everyone else in the house. It’s a fairly quick read and fans of dysfunctional family dramas will devour this one. I chose to use one of my last Audible credits and purchased this book. I wasn’t sure if I would enjoy it, but then so many people said I would, based on my love of memoirs. I listened on audio and think that helped me enjoy it even more because Fey reads it herself. She offers lots of side comments and extra information by reading it herself. I haven’t seen any of her recent shows, but do remember when she did the news on SNL and played Sarah Palin. That was back when SNL was funny (in my opinion). Her SNL stories were the best part for me, but I also appreciated her hilarious stories of growing up and traveling away from NYC for the holidays. It’s a very quick listen and one that many would enjoy. Everyone seems to rave about these SMITTEN KITCHEN cookbooks, so I decided to check one out since I love reading cookbooks. Early on I knew it really wasn’t a cookbook for me. I guess I am a pretty boring cook in comparison to Perelman. Many of her recipes were too complex and used ingredients our family would never consider eating or buying. I did make the Broccoli Cheese Toasts ( I didn’t write down the exact name). They were fairly simple to create and actually quite delicious. My husband and one son liked them a lot. I did screenshot a couple other recipes that I have yet to try, but for the most part, it just wasn’t recipes my family would make. I did appreciate her writing and the way she described a recipe, the flavors, the creative process of coming up with the dish, or the story behind making it for her family. Well, I wanted to give Reichl’s books another try. After not really enjoying My Kitchen Year, yet hearing such great things about her, I decided to give one from her backlist a try. This memoir takes her from LA to NYC where she begins her job as a restaurant critic for the New York Times. But, because everyone knows she is coming and her picture is posted in all the top kitchens, she decides to take on various disguises. As she chooses her characters, she starts to become them (for good or bad) and realizes the harsh world of dining out in NYC when you are not “famous”. Her writing is different in this one. Not depressing or aggrandizing. Even though I will never eat in the restaurants she shares or eat the food she delicately describes, I was mesmerized. Her descriptions made my mouth water even when she talked about lamb or foie gras. Reichl reads her own book and all the voices she uses were just fabulous. I found myself picturing the women as she spoke for them. It was an AUDIOFILE Earphones award and rightly so. I so enjoyed the listen. The book ends when Reichl decides that she no longer enjoys critiquing restaurants and magically gets a call to become the Editor of Gourmet magazine. Interesting since My Kitchen Year began with her end at Gourmet. My heart broke with her as she watched her friend, Carol suffer through ovarian cancer. Her view on life changed after that experience and she has Carol to thank for that. If you are looking for a food memoir or to find out the inside scoop of NYC restaurants or how a food critic does the tough job of reviewing restaurants, this is for you. Even though it is over ten years old, it is still a delight. I know this isn’t a book, but it’s a book made into a movie! My husband forgot to rearrange the Netflix DVD queue and this movie arrived last week. It’s based on the book A MAN CALLED OVE and I’ve been wanting to see if after reading the book last year. I loved the book which usually means I will hate the movie, but not this time. I loved that it followed the book very well. The movie is in Swedish and has English subtitles, so you have to pay attention, but it’s so well done, you forget. My husband wasn’t thrilled about the subtitles and didn’t know anything about the story, but he was quickly absorbed and really enjoyed it. As always, I recommend reading the book first, but if not, the movie is a very close second. This post contains affiliate links. If you choose to make a purchase through the above links, I may make a small commission without you having to pay a cent more for your purchase. 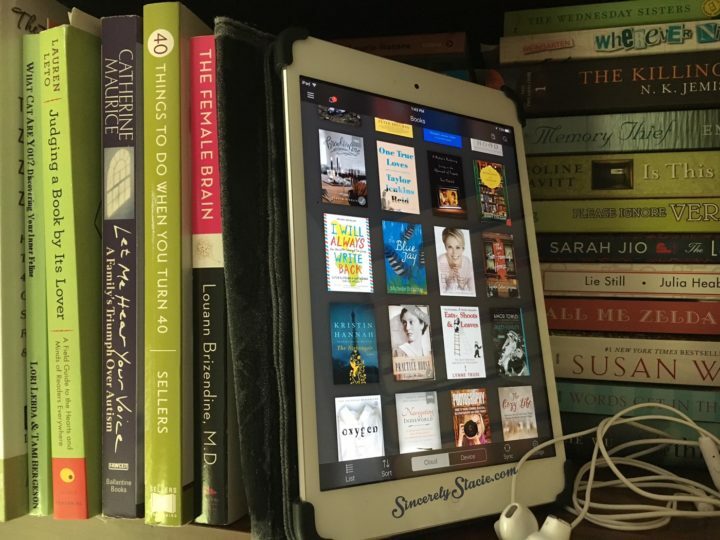 I will have to check out Educated on audio – I usually pick up nonfiction titles that way! And those broccoli melts from Smitten Kitchen are one of my absolute favorite recipes, I make them all the time! Yes, if you haven’t read it yet and you like nonfiction audios, it’s definitely the way to go!